The QHGroupBox widget organizes widgets in a group with one horizontal row. 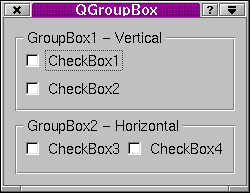 QHGroupBox is a convenience class that offers a thin layer on top of QGroupBox. Think of it as a QHBox that offers a frame with a title. See also QVGroupBox, Widget Appearance and Style, Layout Management, and Organizers. Constructs a horizontal group box with no title. Constructs a horizontal group box with the title title. Destroys the horizontal group box, deleting its child widgets.